EnvokeIT is from origin a Scandinavian company started by a couple of persons working in the Server Based Computing market. During their jobs they developed a set of nice tools, which are (in their standard version) available for free. In this article I will try out these tools. Port Checker is a stand alone executable which can be used to check from a client that the default Citrix ports can be reached to a specified server. The tool will probably execute a telnet command to the Citrix ports and checks is the response is what you expect. This tool is great for the helpdesk troubleshooting connectivity problems on PC's that are not fully managed by the IT department of the company. Think of home workstations, workstations from a branch office or party trusted supplier or consumer. It is much easier for the helpdesk to provide the end user with a GUI than explaining to the user to type in command prompt all kind of executables with parameters. The free standard version can check the XML service on port 80, ICA communication on port 1494, Session Reliability on port 2589 and SSL traffic via port 443. If you would like to use other ports, you can buy the advanced edition of this tool. App Launcher is another useful tool for your Helpdesk employees. Like port checker this tool does not any installation and can be started as a stand alone tool. App Launcher uses MFCom, so you start the tool from a Presentation Server (version 4 supported only) or a client where you registered MFCom. When starting App Launcher all applications on the farm are enumerated with their assigned servers. If an end-user is reporting a problem with an application the helpdesk employee can easily choose the same server the end-user is connected to. Via the connection settings the helpdesk user can connect with the same features enabled as the end-user. Very useful to check if the helpdesk can rebuild the problem the end-user is mentioning, to start the application on the same server, bypassing the normal load balancing process, especially because you can configure the ICA settings for that session out of the App Launcher tool. With Server Manager you can easily to delete and re-publish all Published Applications on a selected Presentation Server. Before removing the published applications from the server you export the Application information into a XML file. After that with a single click the server is removed from the Published Application properties. The tool can be used in cases you would like to do maintenance on that server or if the server isn't behaving as normal. With a few clicks all applications are removed from that server, which is logically much quicker than walk trough all the published applications. Also when you exported the settings you after the maintenance easily add the server back to the Published Applications. Launch Checker is the only tool who need some installation steps. The executable need to be copied into the %systemroot%\assembly, registered as a COM object and a registry key need to be created per server. At this moment this are manual steps described in the manual. After a reboot launch checker notices if an administrator (an account that is member of the local administrator group) starts an Published Application. 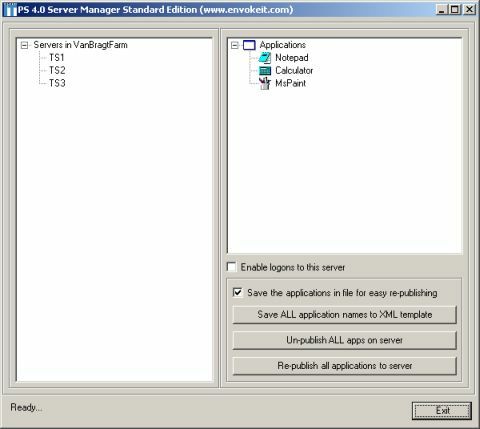 If the user is administrator a message box will appear with the question if the user wants to starts this published application as an administrator. Launch Checker just works for a limited set of applications defined in the tool by EnvokeIT mainly the Office applications and Acrobatreader. EnvokeIT developed some simple but pretty clever tools. Especially the App Launcher and the Server Manager can be very useful during day-to-day support and maintenance. 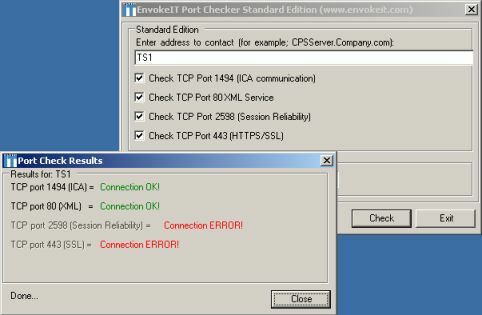 Port Checker is easy to use and can make troubleshooting a little bit easier for helpdesk departments mainly. Because of the installation process and the limited application support, I would suggest to use this tool only if you have problems with the supported applications. The Envoke-IT tools can be found at their website.